The most wonderful time of the golf season is officially here with the 2017 Masters coming to a conclusion on Sunday at the beautiful Augusta National in Georgia. While attending the Masters is a dream for many, simply being able to watch golf on the grandest stage of them all is an incredible treat each year, and we here at CBS Sports are thrilled to bring you wall-to-wall coverage of the Masters. Jordan Spieth is attempting to exorcise some demons and finish in the top two for the fourth straight Masters. Rickie Fowler and Sergio Garcia are looking for their first majors. 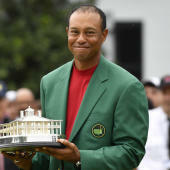 It will all go down live on CBS, CBSSports.com and Masters.com on Sunday. But enough talking about it. Here’s how you can watch as much Masters as possible in Round 4. Want to treat your buddies to a round of golf? Enter now to win a dream day at your favorite course care of CBS Sports and GolfBook! Featured Groups -- 10:30 a.m. to 7 p.m.
Amen Corner -- 12-6 p.m.
Holes 15 & 16 -- 12:30-7 p.m.